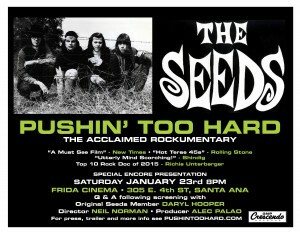 Pushintoohard.com now has information on all the new dates for screenings in Phoenix, Tucson, Sedona, Fresno, San Diego, Vancouver WA, in our own back yard, Agoura Hills, and also Pittsburgh, Cleveland, and Long Island. 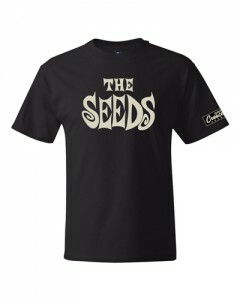 The recent GNP/Big Beat reissues of The Seeds classic catalog are available for a short time as a package sale at our online store. If you haven’t Liked us on Facebook yet, you’re missing out on some extras and outtakes from the documentary that we have been sharing there. You can also check out our YouTube channel directly. 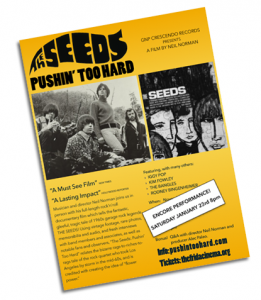 New dates coming for fall showings of Pushin’ Too Hard! 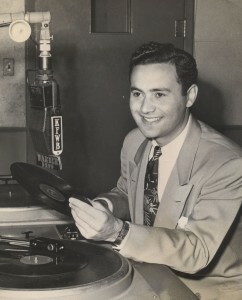 As promised in this post. Look for Mid West and East Coast dates for September and October soon. Are you a Connery purist or did you have a soft spot for Dalton? If you came of age in the 90s you probably had a Brosnan standee in your dorm room. Just me? Ahem. We’re hoping to see SPECTRE this week! Did you see it? For licensing albums or single tracks into compilations or other products, please contact us directly or leave a message here. The Crest Sacramento has their ticket link up! Daryl will be attending with Neil and they will partake in a Q&A. Get your questions ready!